joy magnetism: Casa Loma, eh? 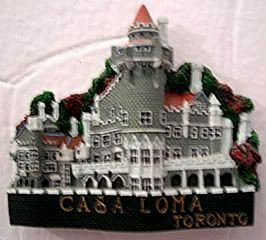 Casa Loma is billed as one of Canada's most famous castles. We just happened to stumble upon it on a random roadtrip to Canada. It's the former home of Sir Henry Pellatt, a financier - who was at one time, Canada's answer to Carnegie, Rockefeller and Morgan. It was built on a hillside, and had a great view of Toronto. Of course, we took the tour, ran around the rooms and the grounds. And, of course, the only thing I remember out of all that history is that they filmed parts of The Skulls with Joshua Jackson and Paul Walker in the Conservatory. What? It was a good movie!